WAIST HIGH: Gary Lightbody Forms Tired Pony With Peter Buck. Gary Lightbody Forms Tired Pony With Peter Buck. 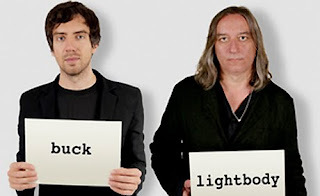 Snow Patrol's Gary Lightbody and R.E.M. 's Peter Buck have come together as Tired Pony and recorded the country-influenced The Place We Ran From, due for release on July 12 from Fiction Records. Long wishing to make a country album, saying he wanted to "get it out of his system," Lightbody said he was inspired to form Tired Pony by alt-country heroes Calexico and Wilco, telling the BBC, "I can't get away with writing pure country music because I haven't lived that life, but I love it so much that I always wanted to try my hand at it." Lightbody said the album takes a look at the darkness in America. Revealing that Peter Buck was one of his all-time heroes, Gary told Q Magazine prior to the recording that he admires Peter's "versatility, he can play any stringed instrument and more besides. I can't wait to see what he comes up with! He's a real innovator, which is great because this is a whole new project." Recorded in January at the Type Foundry Studio in this writer's beloved Portland, Oregon, The Place We Ran From also features She & Him's M. Ward and Zooey Deschanel, Editors lead singer Tom Smith, Belle & Sebastian drummer Richard Colburn, Ivor Novello Award winning writer and former Snow Patrol member Iain Archer, and long-time R.E.M. contributor Scott McCaughey. The album was produced by Grammy Award winning producer Garret "Jacknife" Lee. Gary Lightbody, who has never made a secret of his love for Portland, performed a raw version of a Tired Pony song called "I Finally Love This Town" (which did not end up on the album) last October in the live performance lounge of Portland's KINK.FM while in town for Snow Patrol's show at the Arlene Schnitzer Hall later that evening. Lightbody described the song in the KINK studios, which he said he had written the previous night, as "written in Portland, inspired by Portland." "Point Me At Lost Islands"
"Held In The Arms Of Your Words"
"The Deepest Ocean There Is"